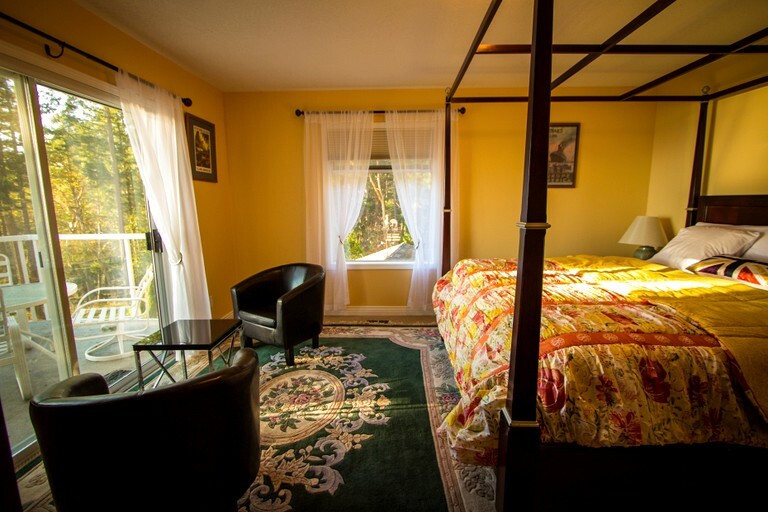 This stylish bed and breakfast suite for two can be found sitting along Mill Bay near Victoria, British Columbia. This suite features one bedroom, an attached full bathroom, and an outdoor patio space with a view of the bay. Upon entering the suite, guests will be greeted with a king-size bed with rich, floral linens. Beside the bed sit two charming night tables with lamps for those late nights when a book is just too hard to put down. Past the bed are two leather armchairs that are the ideal spot to rest with the morning coffee. Speaking of coffee, this suite features its own coffeemaker for guests to use at their leisure. 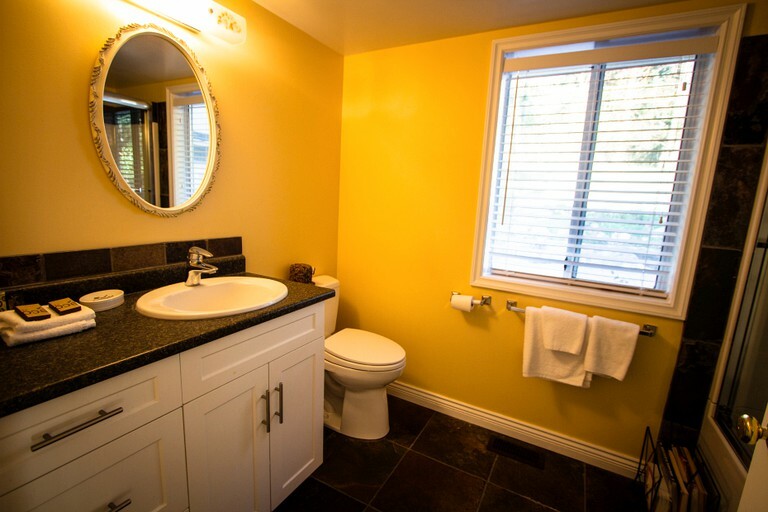 The modern ensuite bathroom boasts a bathtub and shower combination, a large vanity, and a toilet. For added luxury, soft towels and bedding and provided for glampers. Guests will feel more than pampered here with an outdoor heated swimming pool, a rejuvenating hot tub, and a sauna. For those trying to watch their figure, vacationers can take full use of the fully-equipped gym. In addition, there is complimentary breakfast each morning. Guests will be able to pick from a hot breakfast or cold breakfast. Vacationers will also have access to multiple washers and dryers, a BBQ grill, a fireplace, and board games to stay entertained. This site's modern amenities include a telephone, a television, a VCR, a movie collection, and a CD player. The hosts have made hiking, kayaking, and cycling right on the site easier than ever, thanks to the provided kayaks, bicycles, and hiking trails. There's even a fully stocked bar that guests can access anytime. Guests can have shuttle service to and from the airport or ferry for an added cost. Interested glampers should contact the hosts for more information on pricing. 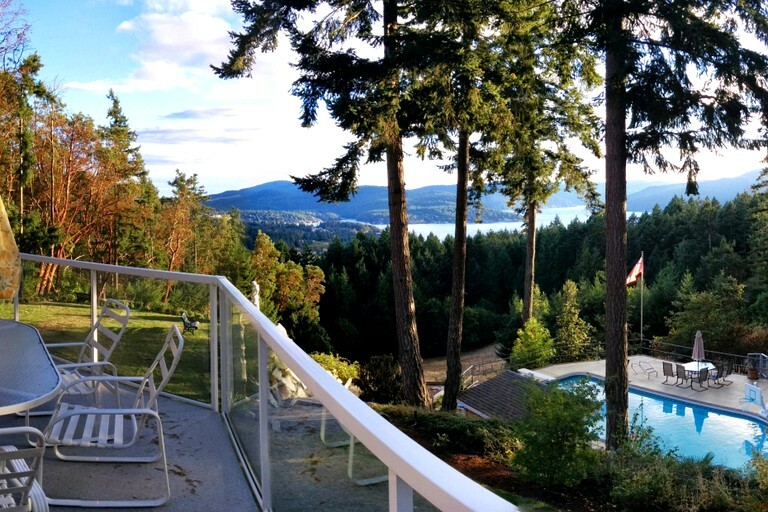 Glampers must check out the Butchart Gardens. These gardens take guests through magnificent floral displays that bring over 1,000,000 guests to the site every year. Guests are guaranteed to see flowers bursting with color, well-trimmed lawns, and smell the sweet aroma of the flowers around them. A trip to downtown Victoria can consist of a day filled with shopping at the over 1,500 stores in the downtown area, eating a savory meal at Agrius Restaurant that focuses on high-quality ingredients, or learning new facts on a Victoria walking tour. This walking tour will teach guests about Victoria's haunted history. Complimentary snacks and red or sparkling wine are provided, and there is a happy hour from 5 p.m. to 6 p.m. for interested guests to have a meet and greet with one another.